for over a year, and it shows no signs of wear and tear. Symbolic, pretend play is important for facilitating the development of a child’s cognitive skills (Cook, 2004). Puppets allow children to develop such dramatic play as their stories take on literal elements. My daughter’s first puppet show was about the hiccuping princess who could not find a prince, because she could not stop hiccuping. Characters, the setting, the problem, and the resolution were all present in her story. Somehow, a puppet theater brings the storytelling to a new level, rather than simply playing with puppets alone. It formalizes the experience. Pretend play means more than just fun for your children. For decades, young children have been engaging in role and pretend play. There are many reasons for this, first and foremost because children love to imitate what they see the grownups around them doing. Studies have shown that role and pretend playing can actually help your child’s imagination grow. Pretend play fosters a child’s cognitive development by encouraging them to problem-solve, by giving them social and linguistic skills, and by developing certain areas of their brains that lead to academic achievement. Children between the ages of two and six especially enjoy engaging in pretend play. Hand Puppets are perfect for this type of role play. Children can act out scenarios in real life, and emulate the normal routines they see every day. Allowing that role and pretend play lasts around five years’ time for most children, a set of puppets is really an investment for a young child. Hand puppets sets come in many styles and many animal and people characters. You can find endless array of puppets which helps ensure that your child will never become bored. 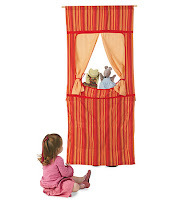 Add a puppet theatre and your child will be able to create ‘shows’ for themselves, family, and all their friends! Whatever puppets and puppet theatre set you decide on, know that you’re looking at an investment into your child’s future. The value of hand puppets goes way beyond giving your child just another toy to play with, it helps a little mind develop and a little imagination soar!